I tried to hold off for as long as I could on the obligatory October pumpkin recipe because of this video. The pumpkin spice invasion of the world!!! But any self-respecting food blogger has to face the facts. 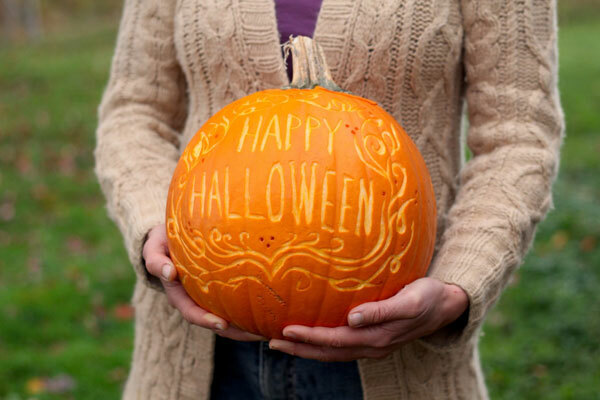 Come October, you should fulfill your blogging destiny and do at least one pumpkin recipe. And really I’m just joking because I actually do love pumpkin spice everything. So riding on the enthusiasm of the last video which involved salted bourbon caramel sauce, I thought I’d continue in the same vein, with an autumn favorite of mine: salted pumpkin caramels. I am not really one to make candy. But when I first saw this recipe on Food 52 last year, I immediately made a dash out the door in search of a candy thermometer. 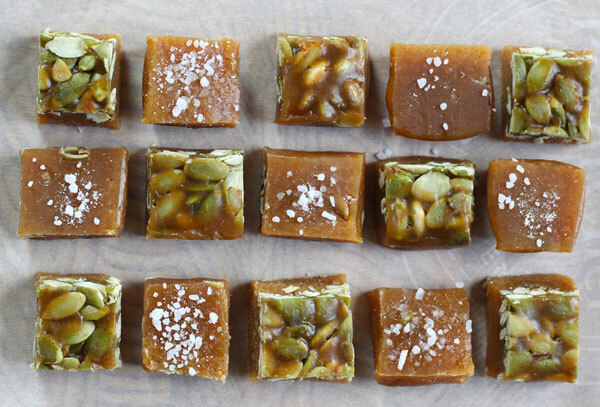 I’ve only ever used it for making these caramels, but was it ever worth the purchase. 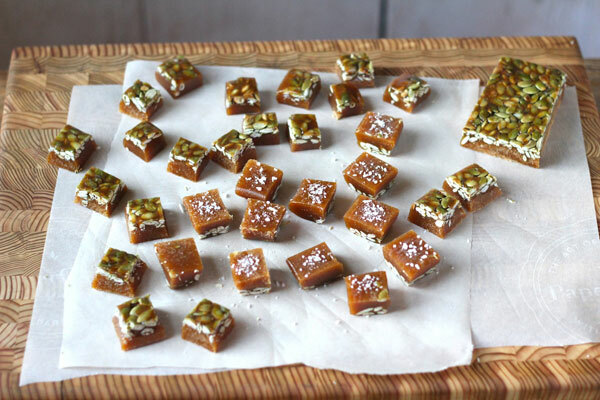 These chewy caramels taste like buttery pumpkin-ey spicy autumn-leaves-blowing-in-the-wind kind of goodness. I adjusted the original recipe slightly to avoid corn syrup because most corn products on the market are made with GMO corn which I avoid. I use all maple syrup in my version and it lends a rich maple flavor to the caramels. 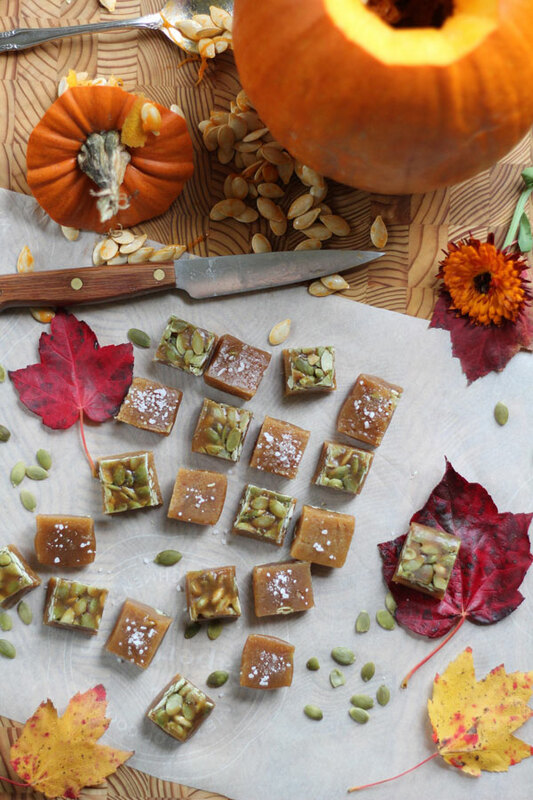 PS: For those of you who are looking for healthier treats this Halloween, I have a delicious paleo, sugar-free, and vegan version of these caramels up on my blog, come check it out. In the meantime, I wish you all a wonderfully wild and wacky Halloween season! Food blogger Aube Giroux of the Kitchen Vignettes blog adapted this recipe from Food 52. Toast the pumpkin seeds in a skillet until they start popping. Line the bottom of an 8-inch square glass pan with buttered parchment paper. Spread out the toasted pumpkin seeds on top of the parchment in the pan. In the saucepan, combine the cream, pumpkin puree, and the spices. Heat it until warm, but do not let it boil. Remove from heat. In a medium heavy-bottomed pan, combine the sugar, maple syrup, and water. Stir until the sugar is melted. Allow it to boil until it reaches 244 degrees (the upper limit of "soft ball" point on a thermometer). Add the cream and pumpkin mixture, and stir gently until incorporated. Allow this mixture to boil and bring it to 240 degrees on the candy thermometer. This is the part that can take time, around 30 minutes, so be patient and watch it carefully, stirring often so it doesn't burn, particularly in the last stages when it gets very thick. Once it has reached 240, remove it from heat and stir in the butter and lemon juice swiftly, stirring well until both are fully incorporated and butter is melted. Now pour the caramel into the pan, on top of the pumpkin seeds. Let it cool about 30 minutes and if you wish you can sprinkle the salt on at this stage (or wait later and individually sprinkle salt on each square once they are cut). Wait at least 2 hours for caramel to fully set before slicing. Use a hot knife to slice them more easily, cutting them into 1-inch squares. If you have trouble cutting them because they are too soft, you can always chill them for 20 minutes before cutting. Wrap them individually in waxed paper, if you wish.